It’s been amazing seeing the number of people enjoying our latest update (v1.1) to the TFDi Design 717. If you haven’t yet had a chance to check it out, be sure to open the TFDi Design Addon Manager to download the update. Version 1.1 comes with official P3Dv4 support, a revamped external model and textures, and a slew of new features/fixes/improvements. We are not going to go into detail about v1.1 in this post (since we have already done that), however, you can read more about it here. That said, we have some exciting events that we will highlight below. So what is #FreshPaintFriday? #FreshPaintFriday (FPF) will be an ongoing event where we release new official liveries for the 717 created by our in-house team of artists. We will go over the history of each aircraft and where it is today. FPF will happen on Fridays over the course of the next couple of months. It may skip a week if needed, as some of the liveries will take longer than others to get right. We won’t be taking requests, however, we do have a list of liveries that have already been heavily requested. Each Friday, we will announce the new livery and provide it for download on our forums. We may also show off a user-created livery on FPF as an honorable mention. So what’s our first FPF repaint? 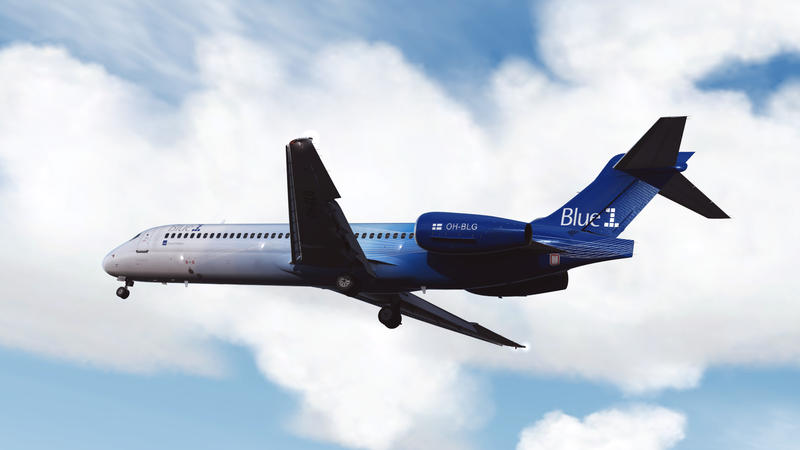 We’re excited to show off the very cool livery for OH-BLG of Blue1. This one has taken quite a while to get right due to its complexity, but it definitely shows when you look at it in the sim. Blue1 was a former carrier for the 717 before it sold its fleet to Delta and Volotea. This particular bird served with Blue1 for nearly 5 years, but it started its life as part of AeBal fleet under the EC-HNY registration. The different paint schemes of this airframe. It was delivered on June 15th, 2000 out of Boeing’s Long Beach factory. For the first 5 years of its life, EC-HNY flew for AeBal, followed by 1 year with Germanwings. It was then returned to AeBal where it served for 3 more years and later wore Quantum Air colors when AeBal was replaced by Quantum. After all this time of identity crisis, it finally found a home with Blue1. This is the point in time that we have restored this bird to. It flew with Blue1 before SAS sold this aircraft to Volotea. After it was sold, the bird lost its Blue1 registration and was re-registered as EC-MEZ. We will be doing several other fun things over the course of the remaining summer months. We will be hosting a screenshot contest, which will be worth participating in, as we have some exciting prizes for winning. More details on this to come soon. We will also continue to share some of the cool new features in v1.1 of the 717 on our social media pages, featuring different functions of the aircraft that you may have skimmed over. As part of our ongoing efforts to stay connected with the community, we will be sponsoring VATSIM events during this time and providing some giveaway prizes for these as well. One of the events worth participating in is the Boston Tea Party event put on by BVA! Read more about that here. Join us at the Boston Tea Party VATSIM Event! We are looking to have fun with the community over the next few months! We will be participating in events and releasing some cool new liveries for the 717 during this time. Our social media feed will be a great place to keep track of what’s going on and what’s coming up.